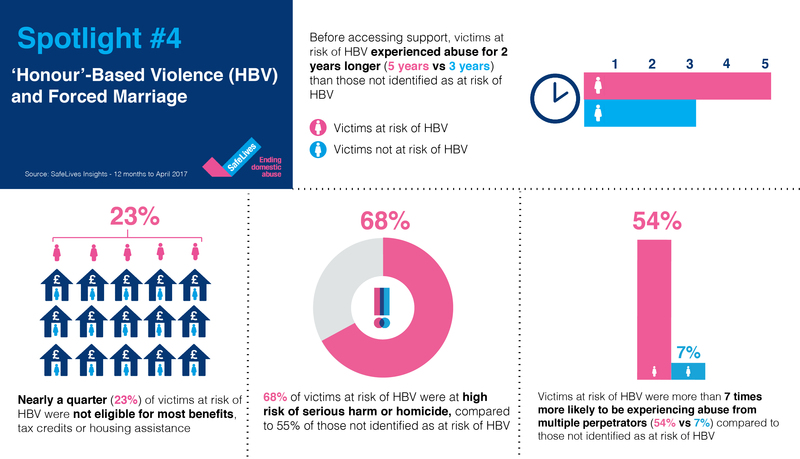 In the fourth of our Spotlights series (1 May - 9 June), we’ll be focusing on the experiences of people at risk of 'honour'-based violence (HBV) and forced marriage. We'll be looking at the specific issues and barriers they face in accessing help, and how professionals can best support them. Through a combination of blogs, podcasts and videos, we’ll be posting the latest research, practical resources and guidance. We recognise that we are not the experts in everything, so we want to hear from you. We're hosting a live Twitter Q&A on 8 June from 10-11am – use the hashtag #YourChoice. Blog: Dr Moira Dustin: 'Honour' and violence against women – what's in a name? Blog: Dr Hannana Siddiqui – State accountability for all: why should BME organisations do strategic litigation? On Thursday 11 May, we hosted a webinar with Shigufta Khan, CEO of Darwen District Without Abuse. Shigufta has worked in the domestic abuse field for over 10 years and is a qualified Idva. She specialises in working with victims of ‘honour’-based abuse and forced marriage, and in February 2009 supported the first victim in the country to take out a forced marriage protection order. Watch the recording.